As of the Victoria Day weekend, the Bare Bistro is open 7 days a week again. The weekday host this year is Sabina. (pictured above) Weekday hours are 11 a.m. until 6:30 p.m. except for Friday when they are open until 8 p.m. On weekends and holidays, the Bare Bistro continues to offer extended hours that include breakfast. As announced last year, Liz has continued to operate the Bare Bistro. Her friendly disposition and passion for quality food is very much appreciated by both members and visitors. As I'm sure you read last year, she even got positive reviews from the Globe and Mail and blogTO. For this season, Liz has brought in a couple of new quality beer suppliers. Amsterdam Brewery, a Toronto based brewery, is supplying Natural Blonde Lager, Big Wheel (amber), 86 the calories (low calorie, light beer), KLB (Kawartha Lakes Brewing Co.) Raspberry Wheat Beer, and Nut Brown Ale (Smooth Dark Ale). McClelland Premium Imports is supplying a number of imported beers from Belgium and Austria. This includes Affligem Abbey Blond, Duvel, Erdinger Weissbier -Bavarian Wheat ale, Erdinger Weissbier "Dunkel" (Dark), Bavarian Wheat Beer, Fruili (Belgian White Beer and Pure Strawberries), Stiegl (100% barley malt. lager brewed in Austria) and Erdinger (Non-Alcoholic, isotonic drink free of chemical additives, fat & cholesterol, yet still has the distinctive, sparkling flavour of a wheat beer). Be careful, the Belgians like to brew strong beers! As high as high as 8.5% alcohol!! The naturist segment begins about 7 minutes into the show. Yoga classes will start this Saturday, May 28th and continue throughout the summer. They will take place in our freshened up Outback building in the Yogi Bare Studio. The classes are being organized independently by Nikki Lafrance who is also the instructor. She is offering 3 one hour classes a week: Tuesday's class is gentle(1-2pm), Thursday's class is fun(8-9pm), and Saturday's class is energetic(11:30-12:30pm). The Daily Drop-In fee is $14 or you can purchase a 6 class package for $65. You can pay her directly or through the Bare Oaks office. Nikki is a nurturing and compassionate teacher working towards her 200hr Teaching Certificate. She'd like to remind you that yoga is extremely beneficial for overall wellness and you can have fun no matter what fitness level you may be at! Disclaimer: The yoga classes are provided by an independent individual. 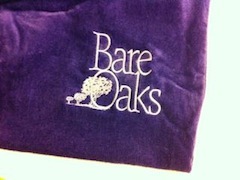 Bare Oaks Family Naturist Park only coordinates the arrangement and is not responsible for the service provided. This afternoon, the York Region Department of Health Inspector has given us the green light to announce that the pool is open!! Since we've been heating it all week, the water is at a very comfortable 29ºC (84ºF). And with the sun finally shining on the solar collectors, expect that to keep climbing! Also, the volleyball aficionados in the park have decided that every Saturday and Sunday at 2pm is volleyball time. Everyone is welcome to join in! Don't know how to play? That's OK, they'll happily teach you. OK, that talking head that popped up every time we loaded the front page was getting annoying. Plus some people complained that the unexpected voice at work was embarrassing – good point. So we've revamped the page so that our spokesperson now walks on quietly carrying a sign that says "click to play video". When you do, then you get the discourse – but you've had fair warning. So you no longer have to be afraid to load the web page while in your cubicle at work. P.S. It only works if your system supports Flash. So it won't work on many phones ...or the iPad or iPhone because Steve Jobs doesn't like Flash. 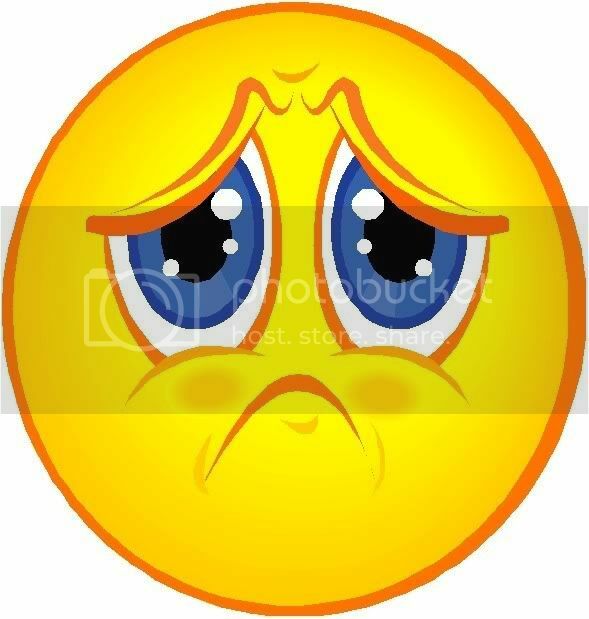 Unfortunately, we have decided to cancel Saturday's Volunteer Day due to the weather forecast. All of the projects for this year were outdoors. Given the almost certainty of a large amount of rain in the forecast, it had become obvious that most projects would not be able to proceed. So the decision was made to cancel the event. Thank you to everyone who was planning to volunteer! We are considering rescheduling to later in the season. Note: As soon as the decision to cancel was made on Thursday afternoon, we posted it to the Twitter feed, on our Facebook page, and sent an email to the blog subscribers. Unfortunately, it was not possible to add a blog entry until Friday afternoon because Google's Blogger Service was having technical problems. Occasionally, people have come to Bare Oaks and been disappointed because one of the amenities is unavailable due to maintenance issues. While we usually post notices in the clubhouse, you can't see that until you get there. So we needed a better solution. In this age of technology and instant communications, there are many options. The Bare Oaks Blog is best suited to important announcement and news items. We don't want to overwhelm everybody with a large number of minor blog postings. And not everyone wants to subscribe to another email list. So we've decided to use Twitter to provide status updates. The short messages you get on Twitter (maximum 140 characters) are quick to read. Plus you can get Twitter updates (a.k.a "tweets") online, via email, or on your phone. So subscribe to our Twitter feed for status updates, notices of new blog posts, and event reminders. We've had a steady number of requests at the Bare Boutique for a pocket towel to carry keys, money, etc... (Because as textiles love to point out, we naturists have no pockets!) Variations on the pockets towels have been sold in the past by the FQN, FCN and, most recently, the Nudist Store. Unfortunately, none of these options are still available. Then last fall, we found this incredibly functional towel. It took the pocket towel well beyond what anyone had seen before! So we brought in 10 towels to gauge the interest. And they sold out within a week! Since then we have brought in 2 more small shipments and sold most of them too. That's impressive given how little traffic the store gets in the fall and winter. As a result we made sure we had a more significant inventory for the upcoming summer season. The one difference is that the latest model we carry is terry cloth instead of velour. It is identical in every way except that the price is $10 less. And customers have told us that they prefer the weight, feel, and absorbency of terry towelling. 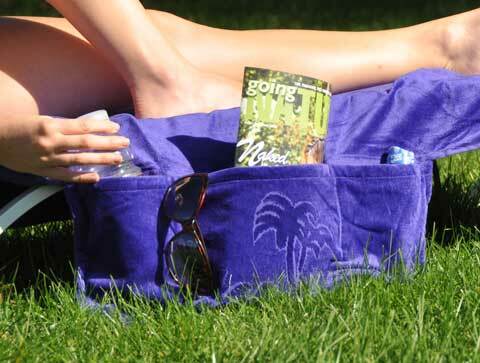 The towel is available with a 10cm x 12cm Bare Oaks logo embroidered in a complimentary colour on the bottom zippered pocket for $9 more. Please note that this option adds about a week to the delivery time. You can also have your name embroidered on the towel for an additional $4. That way there will not be any confusion as to which towel belongs to you. Like the logo embroidery, this option will add about a week to delivery time.